The following is a list of WRH publications. Subscribe to any or all of them today to receive emails with the latest editions. Frontline Tribune is a weekly publication of the Public Affairs and Communications Department of Windsor Regional Hospital. 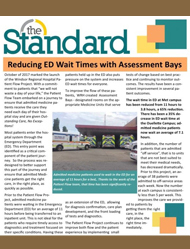 The Standard is a quarterly publication of the Standardization & Optimization (SOP) Team at Windsor Regional Hospital. 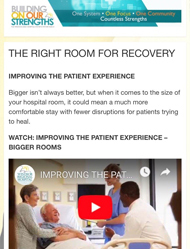 Exploring the Future of Healthcare is a blog highlighting planning efforts and inspiration for the new Windsor-Essex Hospitals System. 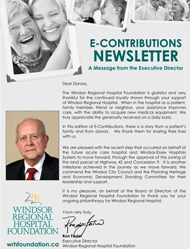 E-contributions is a bi-annual publication from the Windsor Regional Hospital Foundation celebrating the generosity of our donors.